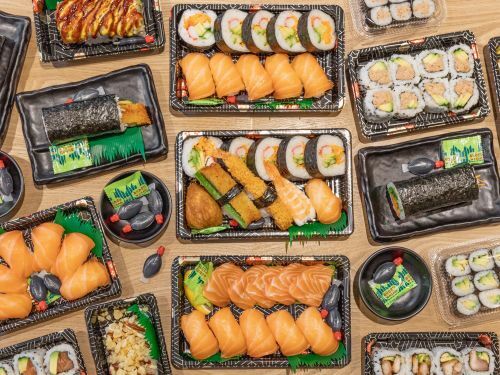 Menulog delivers for Sushi Motto so you'll be able to track your courier on a map. Choice of flavours; tuna, teriyaki chicken, cucumber, avocado. 10 x Cucumber Rolls, 10 x Tuna Salad Rolls and 10 x Carrot Rolls. Choice of two inside out rolls. 6 X Fresh Salmon Nigiri, 2 x Mixed Baby Rolls and 4 x California Inside Out Roll. 1 x Fresh Salmon Nigiri, 1 x Ebi Nigiri, 2 x Chicken and Prawn Katsu Nigiri, 1 x Inari, 2 x Mixed Baby Rolls and 4 x California Inside Out Rolls. Choice of two maki rolls. Japanese ramen with soy-based soup, meat, and vegetable. White udon noodle with soy based soup, meat and vegetable. Served with fresh vegetables, fruit, steam rice and miso soup.